Do you feel like you’re CONSTANTLY washing dishes? Is the never-ending cycle of rinsing, washing, drying, and putting away starting to get to you? Does your back hurt from reaching down into your dishwasher 500 times a day? 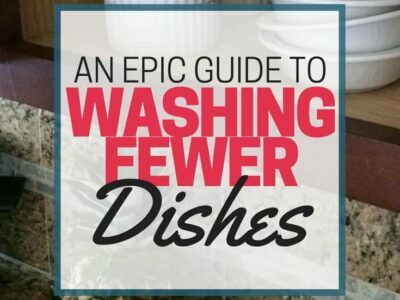 Welcome to the Epic Guide to Washing Fewer Dishes. 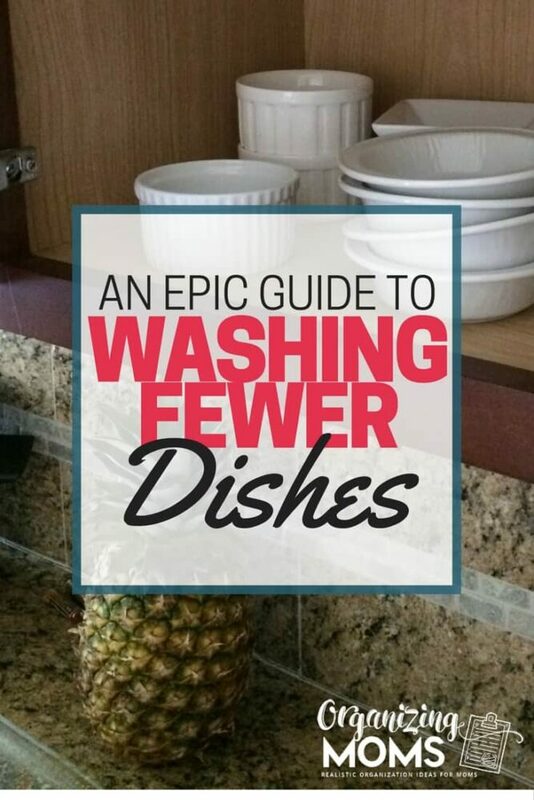 Whether you have a dishwasher or not, this guide will give you some practical ideas to help you cut down on the number of dishes you do every day. I’ve been trying to use fewer paper products, and eat out less. This has helped us cut down on waste and trim our budget, but it’s also resulted in TONS more dishes for me to deal with. 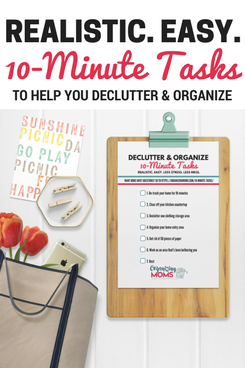 If you’re thinking, “This chic needs to complain less and be more grateful that she has food to eat and dishes to clean,” I totally agree with you, and I’d like to invite you to download a free printable with a message that has the same sentiment. Click here for the printable that highlights the importance of appreciating dirty dishes. These are not one-size-fits-all tips, so use the ones you like, and forget the ones you don’t like. Everyone gets ONE cup or water bottle for the day. ONE. I gave everyone a Klean Kanteen, and I wash them once a day (usually with the evening dishes). Everyone has a different color, so there’s no fighting. I do allow for an extra cup for milk, and I put it back into the fridge after each meal if it’s not finished. We only have one milk drinker in our house, so it’s not a big deal. Everyone else just drinks water. If you have a family that enjoys more beverage variety, make people rinse out their cups. ADVANCED TIP: Limit access to cups. We have a drawer for our kids to use to get their own kitchen supplies. I’ve temporarily taken the cups out of it until we get well into the habit of JUST using the water bottles. So far, so good. Clean as you go. Especially if you have a dishwasher. Instead of putting dirty dishes in the sink, just put it straight in the dishwasher. As you clean as you go, brainstorm ways to eliminate the need for the use of a particular dish. By doing this, I realized I didn’t need to use plates for breakfast toast. It could easily be served on a cloth napkin, which eliminates at least two plates to wash! You’ll be surprised at the smart ideas you’ll come up with! Simplify your silverware. We had big forks, and small forks. Big spoons and little spoons. Serving spoons galore. It was too much, and it made for a more complicated task when putting silverware away. I pulled out half of our serving spoons, the big forks, and the big spoons. Plus I decluttered the bazillion plastic spoons and chopsticks we were holding onto. This made for an easier-to-navigate silverware drawer. An easier-to-navigate silverware made for a child-friendly chore for my littles! 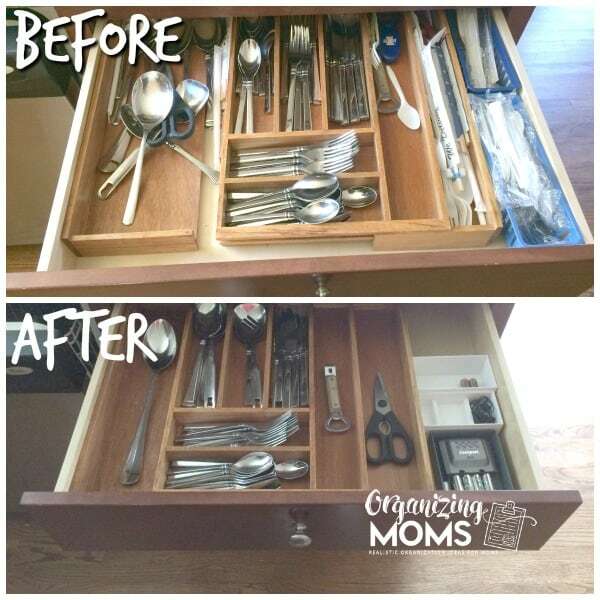 Now they can help me with putting away silverware because it’s super obvious where everything’s supposed to go. Yay for the munchkins! If possible, rinse and reuse dishes during the day. You may already do this with drinking cups, but could you do it with plates or bowls? Take a look at what you wash and see if you could get a few more uses out of it before it’s truly in need of a wash.
Use a plate as your cutting board. If you can, chop veggies on a plate you’re planning to use when you serve a meal. That’s one less thing to wash! This won’t work for all types of plates – some ceramic or plastic plates might be damaged, so be careful. We just have regular white Corelle plates, and it hasn’t been a problem. 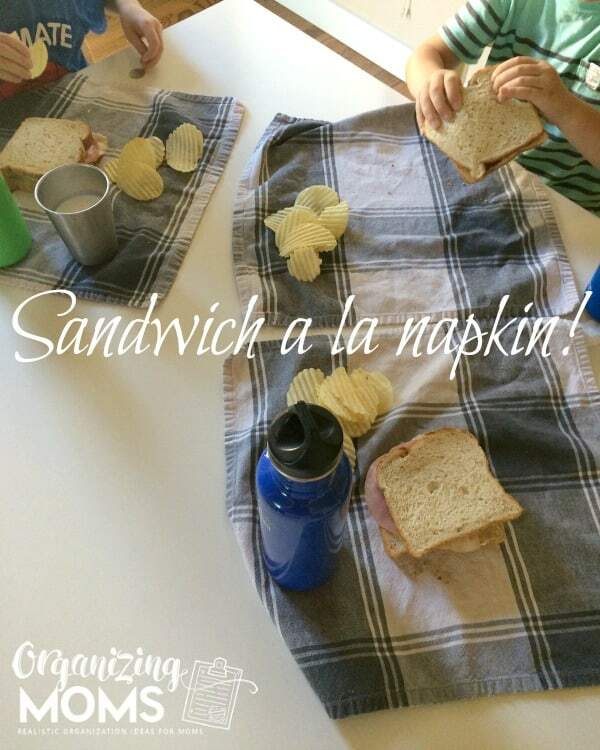 Serve foods like pizza or sandwiches on a napkin. If you could buy in a paper wrapper from a restaurant, you can serve it on a napkin. Every time I do this, it saves me from washing three to four plates. This is huge!! Think it’s a pain to wash cloth napkins? Use a paper towel. Cut down on silverware washing by serving more finger foods. No need for silverware when you’re serving chicken nuggets and apple slices. Don’t put them on the table if they aren’t necessary. When cooking, re-use mixing bowls if possible. Before putting a bowl in the sink, see if you could use it to prep another dish in the same meal. Depending on your ingredients, you might not even need to rinse out the bowl! When baking, try putting everything on the same pan. You can separate with parchment paper or foil if necessary. I put our baked chicken in the oven on the same baking sheet as our potatoes and it works just fine. If I need to take something out early, I can remove it, and put the rest of the meal back in the oven. Experiment with one-pot meals. I made a Pinterest board full of One Pot Meals for Families – click here to see it and get some ideas! When storing leftovers, consider combining foods in the same container. If you regularly serve macaroni and cheese with hotdogs, don’t store them in separate containers. Combine them, and eliminate one leftover container that you’d have to wash.
Store baked goods in the baking dish. I make banana bread all the time. Instead of storing it in a separate container, I just keep it in the baking dish. The one I use has a cover, so it doesn’t get stale. When all else fails, just use the paper plates. You can get compostable ones if you want. What are your tips for washing fewer dishes? Please share with us in the comments!